Welcome to our guide on how to find the best coaches in Football Manager. In this guide, we reveal the importance of setting up a great and efficient coaching team, what the different coaching roles of Football Manager 2019 requires in terms of key staff attributes and generally provide you a few tips on how to setup your coaching assignments for improved efficiency and better training achievements of your players. You will need to know how to find the best coaches and assign them to their best training category in order to get the most out of training (in additional to know the basics of general and individual training in Football Manager, and how workload and training intensity influence the player development and training performance). The secrets on how to find the best coaches and what separates a 3 star coach to a 5 star coach is of great importance. By putting the knowledge on how to find the best coaches in Football Manager into practice, you will be able to find your own 5-star coaches no matter what year you are playing in and ensure happier players at the training ground! Learn how to find 5 star coaches and what’s required of them by carefully tracking down the best Football Manager coaches for you football philosophy and type of save by continue reading. NB! As a great appendix to this guide, we’ve put together a backroom staff search filter with all the different staff roles of Football Manager which you can search from, making it easier for you to find appropriate coaches for your club, and track down 5 star coaches quicker and easier. Your coaching team are the ones responsible for working with the players on a daily basis, according to the training sessions in the calendar. Their role will be to let the players gain familiarity and knowledge of set piece routines, tactics and/or setup of player roles and duties, as well as educating them in additional focuses and traits that’s necessary according to your style of play and player development plan. To help you pick the lead coach for the different training categories, I’d like to quickly go through the different training categories available. The three general training departments are all split up into tactical and technical coaching areas, which looks to improve attributes important within that phase of play, either it’s with or without the ball in possession, out of possession or tactical learning on how to read the game and how the players shall act or react to certain situations. This means that a coaching team may require ideally 10 different lead coaches, one for each training category, if we should emphasize the star rating for each training category. On the other hand, at the minimum, a great coaching team may consist of only 5 coaches: 1 goalkeeper coach, 1 fitness coach and 3 general coaches that are adept at coaching both defending, attacking and possession. Compiling a coaching team of around 10 lead coaches will be nearly impossible for a club below the top level, since their finances and board may not allow it. While a coaching team of only 5 may not be the most effective in the long run, if you shall have any hopes of succeeding with player development. Personally, I recommend to maximize the amount of coaches as soon as possible. Whenever you’ve got the maximum allowed amount of coaches, and if the finances allows it, approach your board and make a Board Request to enhance the amount of coaches allowed. You may have wondered how you can setup a professional and successful player development program in Football Manager. The most basic tool to player development is improving the player attributes by training. One of the first steps before you can even have any hope of succeeding with player development through training is to improve the level of the coaching team, either you search for 5-star coaches or assign specific coaches to their best training category. Analyzing the current coaching team to spot any weaknesses and searching for suitable ‘5-star coaches’ is one important pre-season assignment that I assess immediately at the start of a new save and continuously as my club develops (both financially and at a divisional level). This focus on improving the current level of the coaching team lasts throughout the first couple of seasons, alongside increasing the clubs scouting knowledge, until I have a coaching team that I’m satisfied with (according to my tactical approach and vision for the save). NOTE! Improving the scouting knowledge will not only increase the pool of players but also the amount of backroom staff and coaches within the limits of the selected database when setting up the save, since more 5-star coaches will be revealed. To get a general overview of the coaches visit: Staff > Overview > Coaching Team, which provides you with a list of every staff role related to training. In this section, you’ll able to view a quick comparison of your current coaching team compared to the other clubs level of coaching (best and worst) for each specific training category for your division. By using our ‘Coaching Team View’ (which you can download in our pack of custom views, you can easily get an overview of each staff’s attributes and other important information about their coaching style. Here you’re presented with an overview of the different training categories, which staff that’s currently picked to be responsible for a training area plus the star rating of the lead coach and the workload for the coaches within that training category. While the first method provides you with basic information about each staff (either it’s the assistant manager, head of youth development or any other coach), the secondary method gives you more in-depth information about each by hovering over with the mouse cursor on each line of coach (name or selection button area). By hovering over the coaches name or picture, you’ll get information about his best training category, while hovering over the selection button area for each training category, the required staff attributes relating to training is highlighted. The tooltip and description of the coaches best training category identifies which training category that will provide him the highest star rating and which fits his coaching abilities. Before selecting coaches for each training category, I’ll spend a few words explaining how this works, as there are a few restrictions and opportunities which may come in handy. As manager you can assign yourself to work with any squads, no matter if it’s the Reserves, Under-23, Under-21, Under-19 or Under-18. This means that it’s beneficial to be smart when setting up your manager profile. First Team Fitness and Goalkeeping Coaches will act in the same way as the manager. They will work with both the First Team, Reserves / Under-23 / Under-21 and the Under-19 / Under-18 squads. General Coaches (First Team or Youth) can lead one or more training areas, even goalkeeping and fitness. Note! By being part of several training areas, the star rating will decline. The head of youth development will be able to work with the first team and reserves in additional to the Under-19 / Under-18 squad. All backroom staff can be provided with a contract offer where a secondary job (which differs from his current one) is included. This way you can have a director of football working as a coach or a head of youth development working secondary as the Under-21 manager – excellent if you’re running a minor club with limited budget. Fitness and Goalkeeping Coaches are regarded as Specialist Roles, which means that they can NOT be assigned to any other category than the area their role dictates. For example Fitness Coaches can only be responsible for Strength and/or Quickness. Under-19 or Under-18 coaches can ONLY work with the youth team, as long as the training facilities are NOT shared with the Reserves / Under-23 / Under-21 or even the First Team. B) … or simply go to Staff > Overview. A graphical and color coded visual of the different staff teams shows you available slots either in a list of all available staff roles or as a transparent person icon. Your opportunities and restrictions regarding the different staff roles have been written about in our guide to staff responsibilities and backroom advises and more detailed information can be found for each staff role in Football Manager here. “If two or more squads share facilities – for example a First Team and a Reserve Team train at the same site, then the assignments are opened up for anyone from any squad to move around freely”. Personally I prefer to create a spreadsheet of all the backroom staff (normally coaches and scouts), which gives me a brief overview of the staff available which I compare to the style of play I want to play, their preferred formation, personality and essential information as best training category. Even though I might need to manually select a coach to two or more training areas to see what gives me the highest star rating compared to the lowest workload, the best training category pinpoints training areas I need to address for the future. In the template I also add an ‘X’ to staff that I’d like to swap out and replace in the future as they are regarded as ‘Not Needed’, either because they not fit my football philosophy or that they lack the abilities to be an important asset in player development. You can download my template for staff analyses here. The file is in Excel (.xlsx) format, which means you need Microsoft Office to edit it. To improve the effectiveness of training and the player development progress of attributes, it’s important to balance out the workload of each training area. This means that the more coaches you got within your coaching team with high ratings within a training section the lower the workload for each coach. This means that the coach can spend more valuable time working on individual players, which further impacts player happiness and eventually improved training achievements. With that in mind, it’s wise to spend a few minutes setting up the coach assignments in the best possible way, either you need to plan for the long term or the current coaching team is of a professional status with several 5 star coaches already. By having the maximum allowed number of coaches, it not only reduces each and every coaches workload and improving the overall training quality but also ensures better training performance – how much the players will gain from training. To increase the amount of training quality for your players it is important to reduce the coaches workload and improve the level of specialization, and further increase the coaching team (both for your first team and youth team) to maximize the player development. 1. Assign two or more coaches to the same training category (by using my preferred method that I will talk about below). Recommended. 2. Improve the level of coaches, by tracking down coaches with an higher star rating than the current ones. My approach, if my board or finances allows it, is to approach one head coach for each sub-category and some general coaches also referred to as overall coaches. These overall coaches shall reduce the workload for the lead coach (which provides a high as possible star rating) and be assigned to two or three training categories according to what gives a decent star rating (two to three and a half star). When tracking down lead coaches for each training area I aim to look for at least coaches with 3,5 stars with the aim of improving the level to 5-stars in a longer perspective, but this will depend on the level of the league, either you are managing a minor or a top club. If my finances does not allow it, I try to approach staff that provides as high ratings for training categories that’s vital for my style of play, for example possession tactical and possession technical when using the famous tiki taka style of play. I try to set up the coaching assignments so the coaches overall workload for each category is ‘Average’. One way is to divide your search for new coaches after specialist coaches and overall coaches, where the specialist have high attributes in one or two training categories, while the overall coaches will have a decent star rating in 3 or more assignments. This means that one coach may have a 2 star rating in minimum 3 training areas. Another way is to create your manager profile with even attributes in coaching when choosing your managerial style at the start of a new save, which means that you will be involved with all the different general training areas and build a relationship with your players that way. Personally, I normally have a preference to selecting a manager with focus on attacking, tactical, technical and mental attributes, as these are often most difficult to find free or affordable coaches with. This way, I assign myself to ‘Possession Tactical’ and ‘Attacking – Tactical’ and look for experts of defending coaching and technical training, rather than I’m involved with it. How to benefit from your manager profile and choosing your managerial style is something I’ll discuss in a later article relating to incorporating an overall football philosophy at your managing club. No matter the managing level, the importance is to find the best coaches as possible where 5 star coaches is the best. So, to the essence of this guide, as everything above takes into account the key attributes required for the different coaching areas. Previously we have discussed the Football Managers staff attributes, and what they mean. The staff attributes, aka their level of quality, will determine their star rating and which coaching category they’re best suited for, corresponding to his coaching style. While you in Football Manager can highlight a backroom staffs available staff roles and get the appropriate staff attributes required, I feel it’s important to understand what’s behind these attributes. The general coaching attributes is the basic important attributes for every backroom staff member involved on a daily basis with training and player development. These staff attributes should be as high as possible to maximize the coaching star ratings. In additional to the staff member’s personality they will influence how the coaches will act on a daily basis; their passion, drive and determination to make the players better alongside how they motivate your players to work harder, as they are all mental abilities. Alongside these key backroom staff attributes for the coaching staff it’s important to track down coaches with a ‘positive’ personality. Here I prefer coaches with a resolute, model professional, driven or determined personality since their personality may impact on the youth intake and rub off onto the youth players. Determination: – A determine coach will have a higher mental drive and desire to improve his coaching skills and coaching qualifications. It has nothing to do with coaching a player’s mental approach. Instead a coach with high determination will look to take coaching courses to improve himself and have better possibilities to succeed in additional to have an inner drive to better the players they work with. The level of determination will also influence his mental drive to work in the best leagues in the football world as he often has the desire and ambitions to work with the best players. Level of Discipline – This staff attribute affects the level of strictness and shows us how strict the coach will or will not be in the daily management and training. A coach with low level of discipline will be more relaxed, something that may not be a good thing. A strict coach may discourage players from raising complaints in private chats and other similar aspects of managing players, while it’s easier for players to exert a little more power and influence over staff with low level of discipline. Strict coaches will often get quicker and better results, but can also upset your players which lowers their morale and eventually stresses them out, similar to what is rumored to happen within the Manchester United squad of 2015-2016 season working under the highly strict manager Louis van Gaal. Level of Discipline is tied to staff attribute mental, as a strict coach needs good level of mental attribute to make sure he can act and observe the level of stress and increase/decrease his strictness to keep the players happiness and preserve good morale. Motivating – The coaches ability to motivate and inspire the players to do well and improve. It affects how well the coaches are able to prepare the players for a variety of situations that may occur. A coach with high motivation will also influence the players work rate and affect their determination to play better, train harder and do better and eventually reach their seasonal goals. A coach with high level of motivation can also have a great effect on players prior to matches as he will likely pump them up – influencing their self-confidence making them believe in themselves, their abilities and build up the overall consensus to succeed with the tactical approach and achieving their goals. In regard to training, players working under a coach with high motivation will take training more seriously and not slack off since they will be more likely to be motivated to work under the current training program, but this is also a matter of players individual personalities and how professional they are. As you’ll discover, motivation impacts a bunch of situations in the daily management relating to player interactions, team meetings, team talks and training. Determination, Motivation and Level of Discipline could be regarded as key attributes for all staff working on the training ground. 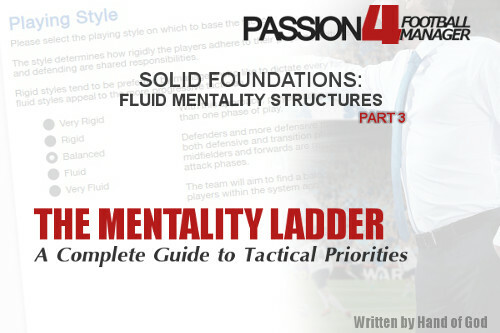 These three mental attributes explained above is vital for success and is the foundation for any backroom staff, either its assistant managers, first team coaches, youth coaches or head of youth development. The level of attributes can be the difference between a 3 star coach and a 5 star coach, or in other terms; the difference between the coaching level: average and excellent. The goalkeeping coaches will only work with the goalkeepers in your team (both first team and junior team), and will look to improve the goalkeeping player attributes such as a goalkeepers abilities at handling the ball, rushing out to deal with the striker in one on one situations or communicating with the defensive line. The goalkeeping coaches will also work on the goalkeepers abilities in distribution, either it’s his passing, kicking and throw ins. New for Football Manager 2019 is that ‘Distribution’ is subjugated ‘Handling’ in difference to the past, where it was an individual training area that required a specific coach for. Goalkeeping coaches is specialists and will never be able to be assigned to the general training categories as long as he is under contract as goalkeeping coach. Handling which improves a goalkeepers handling, aerial reach, command of area, communication and decisions. Distribution is part of the handling training category and looks to improve a goalkeepers kicking, passing, vision, throwing, first touch and technique. Similar to the goalkeeper coaches and in difference to first team general coaches, the fitness coaches will work with every players in your team (both first team, reserves and youth team). They will look to improve the players physical attributes, which is vital to endure the full 90 minutes of a match and cover the pitch no matter its surface and weather conditions, and ultimately have the physical preferences to play with your preferred playing style, either its a style based on physical strength and aggression, quick tempo or direct football where pace and covering large distances is in focus. A coach signed as the role of a fitness coach can only be assigned to the two fitness categories, and are described as a specialist since they can not be assigned to any other coaching categories. When looking for a good fitness coach you should set the minimum attribute level to at least 17 where 20 is the best, since there are few other parameters than the fitness attributes which determines his expertise and his quality of it. The general training categories are the most important training categories, and covers the players technical and tactical abilities – their set of skills which determine their best player role. The coaching staff working to improve technical, tactical and secondly mental attributes is highly decisive in terms of match performance and player reaction on an event by event basis within the match engine. The level of the coaching staff and your clubs training facilities will be some of the matters outside player potential and injury susceptibility which impacts on each players chance to improve their current ability and finally reach their potential ability level. Since training is divided into first team training and youth training, you will need both youth coaches and first team coaches – all with as high star rating and as ‘positive’ personality as possible. Let’s look closer at what’s required of the general coaches for each training category sorted from the overall training areas to the sub-categories we’ve accustomed from within the coaching assignment tab. Tactical coaches will spend their focus on the tactical side of the game providing more accurate advises and explicit information on how the players shall perform under the current tactical philosophy and chosen player roles. The tactical coaches will look to improve the players interaction between each other and how the players shall behave in the benefit of the team as well as improving the players overall knowledge on being tactical astute. Herein lies focus on improving vital mental attributes such as decision making, anticipation, composure, concentration, vision, teamwork and off the ball. It’s of highly importance to find the best option as you want a tactical coach which can translate your ideas on to the players more effectively. A tactical astute coach has the ability to accurately assess situations and therefore coach the tactical side of the game more effectively. * In Football Manager 2019, a tactical coach is incorporated into defending, attacking and possession, which means that there are secondary attributes, such as attacking, defending and mental that impacts his star rating. I’ve decided to keep this section since it’s a mandatory attribute, plus because of the matter to select an appropriate personal assistant for handling tactical tips, as their tactical tips will be more accurate and informative. It is also important to look at the coaches tactical knowledge and his preferred formation according to your tactics, when choosing a good tactical coach. Your tactical coach is also the natural choice to be responsible for backroom advice on the tactical area of the game. You can choose any of your general coaches or assistant manager to be responsible for providing you advice on tactical areas, but I recommend a staff with high level of tactical coaching and tactical knowledge. The coaches will work on the defensive areas of the game relating to aggression, concentration and positioning. They will look to improve players defensive qualities out of possession and how the players shall deal with the negative transition of the game (when the team loses possession of the ball). Their tactical understanding and pressing style is some of the related areas of importance. When coaching the defensive side of the game its important that the coach can translate tactical plans within your tactic in a way the players understands and improve players positioning and understanding on how they shall behave in the defensive phase more effectively. Coaches assigned to the defending technical training will look to improve the players abilities in terms of marking and tackling. Broadly speaking they will look to improve players abilities in pressing intensity and how to recover possession of the ball and how to eliminate threats. Their Marking Style is some of the related areas of importance. The attacking coaches works with the in possession phase of the game relating to situations where the team has the ball and their tactical and technical abilities to score goals and/or advance play via movements. Good attacking coaches can be difficult to find and attract the interest of. Since their primarily focus will be on attacking movements, creativity and technical abilities in front of the goal they will have an important influence on the players tactical understanding of the attacking phase or situations where the team is in possession with the ball. Attacking tactical coaches looks to improve the players creativity and unpredictability in movements and their composure in front of the goal or when in possession of the ball. The coaches assigned to attacking technical category will work primarily with player roles which will come into goal scoring opportunities and influence the game in the final third. Here it’s normally to think of player roles within the ST and AM strata, but some midfield roles such as deep lying playmaker will benefit from a good shooting coach, since they will tutor the players in long shots and finishing, and their technical abilities striking the ball with their wrist, inside or outside of their foot. ‘New’ for Football Manager 2019 is the ability to assign coaches to the possession training category. In fact, this training area isn’t quite new as it’s a revamp of ball control and broken attacking training from the past into more specific areas. The coaches working at the possession training category will look to improve players tactical understanding of the game, such as reading of the game in and out of possession, their decision-making and broadly speaking their technical abilities with the ball. Personally, this is one of the most important training areas and should be carefully attended with a skilled coach. Coaches working under the ‘Possession Tactical’ category looks to improve players Anticipation and Vision, Teamwork and Decisions – attributes vital for basic match performance and tactical understanding in terms of how well players are at foreseeing coming events and prevent them, positioning and interacting with team mates. The coaches playing style is one relating areas of importance that I tend to look at when signing coaches for this area. The coaches will work to improve technical abilities in possession of the ball. Herein comes technique, first touch, dribbling, passing and heading, some basic qualities for all footballers, either their in the defensive or attacking unit. These basic skills does not depend what type of football you’d like to play either, despite a possession style of play requires better technical abilities than for example catenaccio. In regard to a short passing playing philosophy I would say all players needs to have the abilities to control the ball under pressure and often in tiny areas, something that requires both high tactical and technical abilities relating to the possession training category. Assigning a good possession technical coach is important but often difficult, due to the high ratings of technical attribute required in relationship to mental. * This particular training area can be addressed to former players as they have great insight to the mental side and the technical requirements of the game. Similar to any players, backroom staff has a current and potential ability attribute attached to their profile. While these attributes are hidden, staff with unfulfilled potential ability will have the chance to improve their staff attributes and star rating. This is often the case for younger staff who sees the benefit of improving themselves – high determination – and are not reaching the latter days of their coaching career where certain staff attributes may stand still or decrease the older they gets. His current star rating and coaching qualification will be some of the indicators of his current ability and could be some filters to set on the custom staff search view to track down the best backroom staff. Since a staffs coaching qualification is related to his current ability, letting coaches attend coaching courses will eventually improve their level of staff attributes – their coaching quality and skills. Letting the staff take coaching courses will cost limited amount of money and can be an effective way to improve the level of the coaching staff without paying an higher contract termination fee or signing a coach from another club which may force you to pay a compensation fee to his current club. There are 7 levels of coaching qualifications where Continental Pro licence is the highest education – often given to international coaches. Sending a coach on courses doesn’t mean he will automatically receive his new coaching badge. Like players who are unable to learn new player preferred moves, a coach may fail on getting a higher coaching badge and may quit the course after a short period of time. I recommend to look at a coaches age, level of determination and personality before sending him out on a course. Another valuable thing to remember is that the coach will be less effective while attending a coaching course, either it’s taking an higher coaching badge or learning a new language. Apart from attending coaching courses and improving their level of coaching qualification, a staff can improve his current abilities by spending time on the training ground working with the players. Here it’s most likely that you will see ‘younger’ staffs attributes improve little by little over several seasons, especially if he has gone from coaching qualification continental A licence to PRO licence, or from national to continental. I recommend to set the search filter for all these attributes to a minimum of 14, but if you are playing in a lower league, you will need to lower the attribute level. The clubs reputation, the leagues location and your scouting knowledge will influence the amount of possible targets with a decent level of the three general coaching attributes. With attributes set at 14 you will have the ability to find a broad section of good backroom staff and coaches when managing in top leagues throughout Europe and/or South America. Then you can increase or decrease the stats according to the level of the managing team and its division to find coaches suitable under the current backroom staff wages and realistic targets. will be able to observe a players state of mind and react accordingly to ensure happiness. If you buy coaches with no knowledge of your nation (from other parts of the world / other cultures and leagues) you should make sure they have a good level of adaptability as they will then be able to do a great job more quicker and earlier on than a staff with low adaptability. Also be aware that a staff speaking a foreign language and coming from a another football culture will take longer time to settle in. When signing backroom staff for your youth team, it is important to know that the assigned coaches should have high Working with Youth attribute.